Cereal is a breakfast staple in my household because my kids love it. We go through lots of boxes in the course of the month so I am always stocking up and looking for cereals that I think my kids will enjoy. Thanks to My Blog Spark, I had the opportunity to review the new Trix Swirls Cereal. This cereal combines two yummy flavours into one puff of cereal. The flavour combinations are lemony green, berry berry blue and rasporangey orange. Bridget who is 4 years old really enjoyed the cereal. She loved the colours and the fruity flavours and finished every last morsel in her bowl. The box went quick in our house and I know Bridget would want me to buy it again. Trix Swirls is kid-tested and kid-approved in our home. It’s also mom approved since it is a good source of calcium and vitamin D.
Not only did we get to try Trix Swirls, but we also received a gift basket with some goodies! 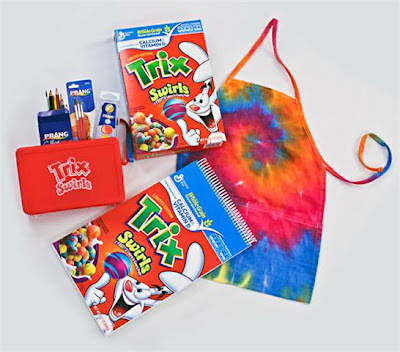 The Trix Swirls Creative Kid Basket contains a colourful apron, set of watercolour pencils, watercolour paints, brushes, a sketchbook and an art supply box. Bridget loves to draw so this provided her with hours of fun. Thanks to My Blog Spark for the review opportunity and giveaway!